During normal activities, lifting heavy objects, vigorous repetitive body motion and prolonged sitting or standing, muscles in the lower back may become fatigued. The ligaments of the sacroiliac joint are vulnerable to stretching and tearing which can cause a separation in the sacroiliac joint with the infusion of synovial fluid causing swelling, pain and discomfort in the lower back. Wearing The Chiropractic Belt™ with correct placement and pressure of the side tension straps stabilizes the sacroiliac joint giving relief of pain while the Adaptive Stabilizer™ allows the movement necessary to gently force the synovial fluid out of the joint space so that the sacroiliac joint can heal. The ligaments of the sacroiliac joint are vulnerable to stretching and tearing which can cause a separation of the sacroiliac joint and pelvic instability. Pelvic instability is often the cause of muscle strain and spasm throughout the body, including the muscles in the back. When pelvic stability is achieved while wearing The Chiropractic Belt™, hypertonic muscles in the back relax with relief of pain. The role of the sacroiliac joint is in aiding the pelvis to accommodate and distribute weight and support the spine, skull, jaw, shoulders, arms, legs and feet. When there is separation of the sacroiliac joint the support of the shoulders, arms and wrist is compromised. Once sacroiliac joint support and pelvic stability is achieved with the correct use of The Chiropractic Belt™, relief of pain in the shoulders, arms and wrists is achieved. The sacroiliac joint, with the help of ligaments, tendons, muscles and fascia, provides support to the internal organs. With the correct placement of The Chiropractic Belt™, there is increased joint stability and reduced inflammation of the sacroiliac joint resulting in better support of the internal organs that aid in assimilation, digestion and elimination. The sacroiliac joint, with the help of ligaments, tendons, muscles and fascia provides support for the reproductive organs. With the correct placement of The Chiropractic Belt™, there is increased joint stability and reduced inflammation of the sacroiliac joint resulting in better support of the reproductive organs and a reduction of menstrual cramps. The Chiropractic Belt™ with the unique Adaptive Stabilizer™, normalizes and stabilizes the pelvis. With the use of The Chiropractic Belt™, hypertonic muscles in the back and legs relax, improving circulation while relieving pain in the thighs. The sacrum and the Ilium form the pelvis which helps support the spine, skull, jaw, and shoulders. Pelvic instability and inflammation of the sacroiliac joint can cause headaches which respond positively once stability is achieved with the correct placement of The Chiropractic Belt™. The Chiropractic Belt™ with the unique Adaptive Stabilizer™, normalizes and stabilizes the pelvis. With the use of The Chiropractic Belt™, hypertonic muscles in the back and legs relax, improving circulation while relieving pain in the knees, ankles and feet. By correctly wearing the The Chiropractic Belt™ so that the Adaptive Stabilizer™ is in place over the base of the spine where the sacroiliac joint is located, joint stability is achieved while allowing the movement necessary for the sacroiliac joint to heal. Once stability is achieved, the shoulder and neck area no longer become stressed while working to help with stabilizing the pelvis and the spine. Most people, experience almost immediate relief in the upper shoulder and neck area when The Chiropractic Belt™ is in place. During normal activities, lifting heavy objects, vigorous repetitive body motion and prolonged sitting or standing, muscles in the lower back may become fatigued. The ligaments of the sacroiliac joint are vulnerable to stretching and tearing which can cause a separation in the sacroiliac joint with the infusion of synovial fluid causing swelling, pain and discomfort in the lower back and the hip(s). Wearing The Chiropractic Belt™ with correct placement and pressure of the side tension straps stabilizes the sacroiliac joint giving relief of pain while the Adaptive Stabilizer™ allows the movement necessary to gently force the synovial fluid out of the joint space so that the sacroiliac joint can heal. 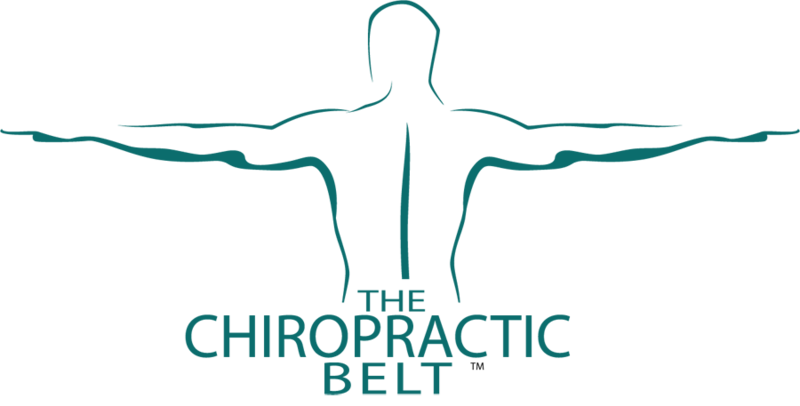 The Chiropractic Belt™ is a comfortable, compact, sturdy support system with adjustable elastic straps. It was designed by a chiropractor to promote gentle but firm support to the lower back assisting in the healing and repair of injured sacroiliac joints. Help minimize the pain you are feeling from a recent injury or from your daily activities. Order online today!